My Vegetable garden has been in the same corner of my pie shaped lot for 20 years now. I am lucky enough to have really great sandy loam soil but the slight slope makes it difficult to water and the triangular shape is a garden planning nightmare. 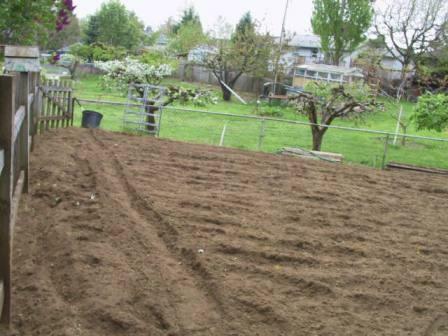 Below is a "Before" picture of the garden, just prior to building the raised beds. My back isn't getting any younger, so the plan included three beds made out of 1 x 12's and 3 beds that were double the height, 24 inches tall. We considered using Cedar but I knew from past experience that Cedar wouldn't last that long, maybe 5 years here in the Pacific Northwest. So in the end we used the new pressure treated lumber. 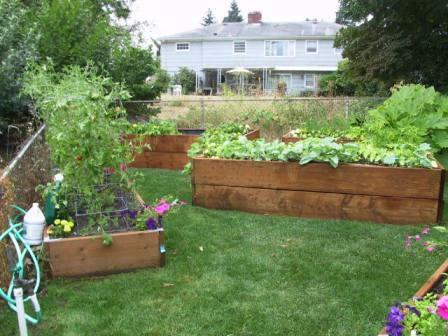 There have been all sorts of studies that show it is safe to use this new lumber in Vegetable gardens but to be on the safe side, we lined them with black plastic. 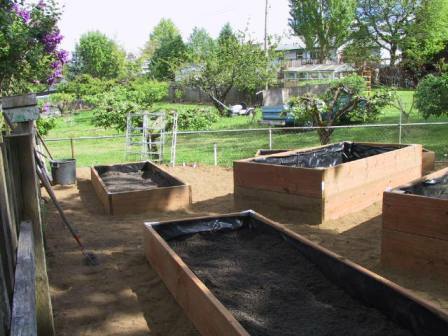 Originally I thought that I would be able to fill the beds with the soil that was in the garden area. But it takes a lot of soil to fill 6 raised beds, 3 of them 24 inches tall. As it turned out, 12 yards of soil to be exact. I went to a local nursery, Yard and Garden and had them mix a combination of composted steer manure, composted forest products and sand. Julie, my Master Gardener friend, had suggested planting grass between the beds, so we spaced the beds just far enough apart for a lawnmower to go between the beds. The emerald green new grass between the beds looked so nice and neat. I could hardly wait to start planting! It was really exciting to start planting in the beautiful new beds that first year. I used the three 24 inch beds to grow smaller veggies, bush green beans, kohlrabi, broccoli, lettuce, snap peas, cucumbers, and summer squash. I planted tomatoes in two of the 12 inch tall beds and 3 blueberry bushes in the last one.